The premise is simple. Two or more players choose Monopoly-style pieces that they then move around the board in turn. All the context for what happens in a space on the board depends on the roll of the dice. Scene It? provides special dice for the game: one is a large version of a normal die with six numbers for determining the number of squares to move; the other die is 8-sided and determines the category of activity the player must participate in on a turn. 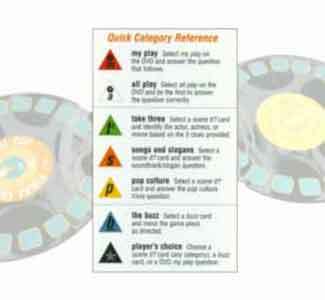 The categories include All Play (all players compete in the activity) and My Play (the player who rolled answers with no competition), both of which rely on the DVD for content. Then there are Trivial Pursuit-type cards with the categories Take Three, Slogans and Soundtracks and Popular Culture. The last element that affects game play are the Buzz Cards, similar to Community Chest and Chance cards in Monopoly. A player rolls both of dice, moves on the board and then takes action. Once a player or team reaches the end of the board, there is an "All Play to Win" question. Getting this one right wins the game and missing it sends the player into "Final Cut," which provides continuing opportunities to win the game. The questions seem to cover a wide range and the categories are different from other trivia games. Instructions on-screen and on paper are clear and handy to have both ways and the game pieces are unique. The quality of the DVD production is excellent and it adds much to the experience of the game. The menu navigation and integration with the board is nicely and efficiently handled. There are clips followed by questions, as well as pictograms and hangman-style word puzzles and questions where an actor's roles are shown in order for the players to identify him, among others. This last one is interesting in showing how many movies one can watch by an actor and never know the names of the characters he or she plays! There is the capability to fold in the board for shorter games, which is novel, although our experience is that the normal games go pretty quickly. The ebb and flow of the game is interesting with a mixture of the questions where a player is on his or her own and the times where all the players are competing head-to-head. There is plenty of rooms for making fun of opponents and also excellent chances to give opponents fits with Buzz Cards. In setting up the game, the first difficulty was arranging a playing space that provided a comfortable position, access to the board and a clear view of the television for all players. The board is rather uninspiring; dull spaces that could have offered more move instructions or at least movie images instead a blank gray. More spaces would make each game last longer. Although creative, we did not like the Buzz Cards. It seems to us that if the instructions on these cards could be provided in the spaces themselves. They proved to be "time wasters" for serious trivia buffs, who want more trivia, faster! Unless you're in a large drunken group, the tie-breakers were lame. We were hoping for more trivia! Tougher questions seem more appropriate. According to their website, Scene It? is the first game to employ Optreve, a new technology that enhances the functions of a DVD player by allowing DVD players to randomly access hundreds of video clips and puzzlers and keep track of what has already been played. Optreve manages the digital game elements including video clip, audio clips, and trivia questions, shuffles the questions and deals them out during the game. Optreve also tracks the questions, puzzles and clips that have been used in order to make a fresh game each attempt. The DVD played well in most players in which we tried it. the DVD Can also be used in laptops that support DVD playback, Xbox with a converter and the Sony Playstation. One player could not handle it, but it may have been because it was an older model from Apex. Between two sessions of the game, we noted that the feature that mixes up the questions did not work and the same clips and questions came up. However, in other sessions different clips and questions did come up. I have to imagine a few more sessions will reveal the actual life of the game. No one will play when it becomes obvious that someone knows all the answers in advance. Pressing the return button on the remote advances to a new question if one appears that has been seen. Scene It? looks like it could be great fun for parties with the idea that even casual movie fans can participate. 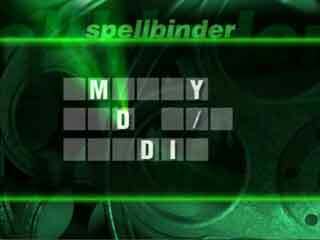 The unique aspect of using the DVD player to provide the clips, puzzles and questions can't be underestimated in its novelty. It supports the creation of 4 teams and the fast-moving nature of the game would support some decent play, complete with commentary and jibes. Some special physical arrangements might need to be made depending on the number of players. 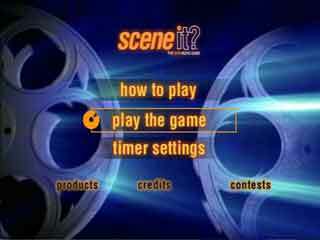 More information about Scene It?, including online samples with movie clips, can be obtained online at the website.